To the beach (and back)! We just got back from a really fun beach vacation … definitely the best beach vacation we’ve ever had. As long distance training, I decided to ride down to the beach via a route that would take me over Alabama and Florida’s highest points in a single, long ride. Kristine suggested that I also ride back home, so that meant no need to ride at all during the week, which meant we really got to enjoy a beach vacation without trying to work in rides. I’ve included a write-up of my “there and back again” rides after the screenshots of instagram pics from the beach. These aren’t clickable so just scroll and squint! We brought the kids’ bikes down with us, but Kristine and I rented beach cruisers from Big Fish. I took Josiah on some fun exploring rides through some cool single track in Deer Lake and Point Washington state forests. We had a blast at the beach spending most of our time on boogie boards trying to ride waves. I went on a solo beach cruiser ride through Point Washington late one evening and ended up nearly getting lost, running into lots of spiders, scootering myself through some giant mud puddles after throwing sticks and rocks into the water and along the side to check for snakes, and finding some flowy singletrack (the greenway trail) – in other words, it was all kinds of awesome! Point Washington state forest greenway trail … Awesome except for a few of these guys. I ran directly into this one, and I threw him off but he landed on my Garmin and crawled here. My plan was to leave at midnight Saturday morning and try to make it to the beach by about 10PM Saturday evening. Complicating this plan was two things: rain and a bee sting. The bee sting happened earlier in the day on Friday when I was going for an easy ride around town. I reacted immediately to it (see pic below), but I expected that it would calm down by the time I needed to leave to ride to the beach. Bee sting about a minute afterwards (top) and then 10 minutes later (bottom). Instead of calming down, it got slightly worse. I kept it elevated horizontally with ice on it most of the rest of the day as I worked on the couch with my laptop. By midnight, it wasn’t any better, but it wasn’t necessarily that much worse either … until I started to ride in the rain. If it was raining, I was going to wait until later to leave, but there was a large break in the storm system according to the radar. So even though there was a heavy rain mist, I decided to head out anyway. I got completely soaked by the time I left my neighborhood, but then there was a nice 75 mile break in the rain all the way to the base of Cheaha at which point I got hit by the first of several rain showers that would hit me over the rest of the ride. Even though the rain was annoying, I would say I spent a good 60% of the day dry and only 40% wet. Not too bad a trade-off considering how cool the temps stayed (in the 60s and 70s all day). The problem with the rain and the bee sting is that I think my leg got infected either from the sting or from road grime getting into the hole where the stinger was. My initial route included a lot of major roads that were really well paved. But once I started to make my way over to Talladega and Mount Cheaha, I started to pick up some rougher roads. Each bump reverberated in my right leg and increased the swelling. By the time I had made it to the top of Cheaha, my leg was really swollen and sore from my knee all the way down into my ankle. Off to a rainy start, but it's stopped for a few minutes now. My first stop of the day came at the top of Mt Cheaha shortly before sunrise. It was raining, cloudy, and very windy, but I had made it to the top of the highest point in Alabama with lots of energy and a long downhill section ahead. At this point, I was still optimistic of making it all the way to the beach on schedule. I only stopped for a few minutes to take pictures and instagram my progress. Alabama's highest point – cheaha lookout tower. The wind is roaring up here. “Alabama’s highest point – cheaha lookout tower. The wind is roaring up here.” Saturday at 5:22AM, Mount Cheaha, highest point in Alabama at 2407′. My second stop of the day was for breakfast at Jack’s in Lineville, Alabama where I could see in the full light of day how much my leg had swollen. Plus, the first 15 miles of AL-49 had some rough chip and seal to make things worse. Lineville, AL for breakfast 100 miles in … my bee sting from yesterday has completely swollen my lower leg. After an excellent breakfast and a chance to prop up my leg, I was ready to go again … although standing on my leg with all the blood rushing back into it felt like a bunch of pins and needles. Complicating my departure from Lineville, was a long five mile graded section of AL-49 that had not been paved. It was really rough, but not so rough that you couldn’t go fast – which meant that I either went fast quite painfully over the gravel or put on the brakes on the downhills. With just under 300 miles still left to ride, I wasn’t going to brake on any of the downhills. Eventually, I reached a section where the wrong side of the road had already been paved. There wasn’t great visibility, but where it was long enough to see whether cars were coming ahead or behind me I would hop over to the wrong side and ride the smooth road until either the visibility dropped off or I could see a car coming. This lasted a few more miles until the next state highway intersection. I kept going on AL-49 south, but now both sides of the road were good pavement. The next 30 miles were awesome … beautiful rolling roads across the Tallapoosa River at the Horsehoe Bend National Military Park … all the way until I hit US-280 again in Dadeville. Then a lot of things happened at once … first, it started pouring down rain. Second, the traffic on 280 was awful even for the mile I had to ride on it. I stopped at a Rite-Aid and recharged devices while I went back into the pharmacy and talked to a very nice pharmacist who said I should get a topical cortisone cream for my leg and some non-drowsy claritin to try to help with the bee sting. I rubbed a LOT of the cream on my leg, and that helped the itching completely but didn’t do much for the internal pain. At rite aid to try to do something about the swelling in my leg. Crazy bee sting from yesterday! The next 10 miles of AL-49 from Dadeville down past Lake Martin were fast, but awful. Traffic was bad, the road was rutted with bumps. Eventually, though, the traffic turned off on AL-50 and AL-14, and the pavement got a lot better. The rain had stopped; the roads were smooth; and there were lots of steep hills leading to another crossing of the Tallapoosa River. I was having a blast again all the way across I-85, which is the official end of AL-49 and the beginning of Co Rd 49 for another few miles before dead ending into US-80 (which has lots of sentimental value I won’t get into here). I took US-80 for a couple miles with no problems, but then the County Road I was going to take south (US-80 is an east/west highway) had a bridge out. I asked a guy in a really large pick-up truck who pulled off the highway at the county road intersection if the bridge was really out, and he said yes. He also suggested I try the next county road east on highway 80 which he thought could get me south. I took his suggestion, which was a good route option except that it was rough chip and seal, and that at the very end of it was another bridge out. Fortunately, this one involved only a short detour (one or two miles instead of miles and miles). At this point, I only had about 15 miles to get to Union Springs, Alabama where I planned to have lunch. I thought I was out of food, but I had just eaten a powerbar not too long ago so I figured I could make it the rest of the way and refuel there. I started down US-29 south on perfectly smooth pavement with light traffic (but very fast traffic) and proceeded to get slower and slower. I was bonking and only made it halfway there when I had flashbacks to a ride several years ago in Indiana in November when I bonked in the middle of a heavy cold downpour. This time, the sun was out a bit with temps having risen maybe into the upper 70s. But the feeling of no energy was identical. In Indiana, I had just stopped pedaling and coasted to a stop unsure how I was going to get home. I tried to hitch a ride with two cars that passed, but neither stopped. Eventually, I guess the standing there and resting was enough to let my muscles/mental strength rebuild and I was able to ride home. Here, I was at that same feeling when I reached back one more time to check my backpack and found not only a powerbar but also a powergel. I stopped and ate both of them and was able to make it the rest of the way to Union Springs. In fact, I was feeling pretty good again by Union Springs. I stopped at Subway and had a nice lunch and a chance to ice my leg which was still getting worse. I really was out of food now, though, with 175+ miles left to ride, so I bought 8 subway cookies to take with me. 200 miles in, union springs alabama – lunch break, my calf is swollen almost to the same size as my quad! Re-energized I headed south on AL-223, which was an amazing road with rolling hills, great pavement, and practically no traffic. It twisted its way south and fooled me into thinking I was going to make it around a huge thunderstorm, before the road ended up turning almost diabolically straight into it. It's about to get very wet! Fortunately, it didn’t rain for very long, and I made it to US-29 north, which was confusing since I was heading south, but that took me over to AL-93 through Brundidge, AL to a county road which I took over to US-231 where the county road turned into AL-87 and where I encountered some beach traffic. There wasn’t much of it, because this was still a really rural part of Alabama, but you could see the cars loaded up with bikes and beach stuff – maybe one every five minutes or so. Other than the sporadic beach traffic, AL-87 was really amazing and reminded me a lot of the rolling hills outside of Madison, Wisconsin. My leg started to really hurt during this stretch of road, and I was desperate to stop anywhere that had some smooth concrete where I could take my shoes off without worrying about ants or gravel. I saw up ahead something I recognized from similar sights in rural Mississippi – a tiny post office building. I pulled over the road thankful for the front porch stoop at the closed post office. Taking a much needed break, right leg feels like it is on fire. Subway cookies smashed together – I'm contemplating eating the whole thing, paper and all. After this break, I continued on AL-87 all the way down to Elba, AL where I stopped at Burger King to refuel my camelbak with water. The restaurant was very busy, and lots of people wanted to know where I was going. I called Kristine from outside the Burger King to tell her that there was no way I was going to make it to the beach in any reasonable timeframe, so I asked her to come pick me up at the Florida high point just south of the Alabama border. We tried to time it perfectly so that we would get there at the same time, but I ended up on a rough chip/seal road that went basically through a swamp. I thought the frogs/crickets/snakes were going to jump up out of the swamp grass beside the road when I stopped to call Kristine and update her on my progress. This rough chip/seal road went straight into a dirt road that I needed to take to get to the high point less than five miles away. My toes and leg were so sore by this point that I was afraid I wouldn’t be able to handle the dirt road and took another detour on a different chip/seal road heading straight for US-331. Each cross street was dirt, so there was no option but to ride on US-331 until Kristine protested via a phone call when she saw where I was heading that she didn’t want me riding on that road (having just driven it herself several hours earlier). I turned around and headed a few miles back to the dirt road intersection where I waited for her to navigate the dirt road back from the high point where she could follow me to the end. If I was unable to continue I could just hop in the car. The dirt road was like pristine pavement compared to the chip/seal I had been on, so I had been worried for nothing. Kristine followed along behind as I navigated the dirt roads all the way to AL-52 for about half a mile, another dirt road, and finally Co Rd 285 which takes you to Lakeland Park, the highest point in Florida. I hopped in the car, and was asleep long before we made it to the beach — not even waking up until we made it to the beach house where we were staying for the week. The end! Why take the paved route when 5 miles of dirt is an option to get to the Florida high point. Didn't make it all the way to the beach but very happy to have conquered two state high points in the same ride. I woke up on Sunday with my leg still swollen just as much as the day before and on the advice of a number of friends decided I should head to urgent care and get my leg checked out. Kristine and I headed down to Panama City Beach, which was the closest urgent care facility. After waiting an hour, we saw the doctor who took one look at my leg and said I should head to the emergency room to check for DVT (blood clots) since they didn’t have the equipment there to check for them. He saw us for less than a minute, and said he would refund our copay. I asked if we could stop for lunch first, and he said no – go to the hospital immediately. @kartoone76 knows how to kick off a beach vacation. Urgent care to the ER bc of his bee-sting swollen leg. Just have to rule out a blood clot (DVT) after his accident. Never a dull moment, I tell ya! So we hopped back in the car and headed to Panama City (not the beach) where we were seen fairly quickly – the ultrasound came back negative for blood clots. That is a very interesting test. The technician will put the ultrasound device high up on your leg, and then squeeze the lower part of your leg. You could then audibly hear the change in blood flow in response to the squeezing. If there were clots, then you wouldn’t have been able to hear the change in blood flow because they would have been blocking the passage. The only other two possibilities for my leg were an allergic reaction to the bee sting or cellulitis — an infection of the soft tissue. There was no way to tell for sure which it was, so the doctor treated for the cellulitis with a prescription for antibiotics and for possible allergic reaction to the bee sting with a prescription for prednisone, a corticosteroid. By the next day, the swelling had gone down and everything was back to normal. This write-up won’t be quite as long … I originally had planned to do a shorter 300 mile route back to Birmingham through Selma and the old state time trial course near Sprott. But when I had to cut my ride short on the way to the beach because of the bee sting, I thought I would try and do the entire 380+ mile route in reverse on the way back. This was going well until it got really hot (temps in the mid 90s for most of the day with a ton of humidity). I ended up overheating south of Dadeville, but with some extended stops and iced drinks I recovered fine. On the climb up Cheaha, I called Kristine and asked her to come pick me up in Talladega about 50 miles from home. I could have made it, but I was really sleepy having a bit of dehydration throughout the day. I’ll focus my write-up on the first part of the ride, which was all of Florida in the dark under a million stars. I left Seagrove Beach shortly after midnight and headed down 30A straight through Seaside and Grayton Beach before turning onto Co Rd 285, US-98, and then US-331 to take the bridge over the bay. There was a lot of traffic out, and I was concerned about drunk people returning home from dinner/partying. Fortunately, everything was fine and nobody appeared to be drunk. I got off US-331 as soon as possible though and took the Black Creek shortcut over to FL-20. I was motoring with an average speed well over 21mph despite carrying nearly 100 oz of water in my camelbak plus all the tools, battery packs, cords, etc… that I would need for a 385 mile ride. I routed myself on FL-20 so that I could get to FL-81, which I knew from previous trips to Florida was quite hilly and would connect me up with Knox Hill (a 150 foot climb) where I tried to win last year’s Rapha Rising with a bazillion hill repeats. I took several county roads north of US-90 that put me into really rural parts of Florida. The pavement was perfect, though, which meant that I could fly down some of the hills at close to 35mph. With my little headlight on its lowest setting to save battery, I kept thinking “if the bridge is out at the bottom of this hill, i’m just going to fly into the creek with the alligators”. But the bridge was never out, and the miles just ticked away. I made it 83 miles to the high point of Florida in just over 4 hours. At the Florida high point! Shortly after crossing the border into Alabama, I ran into my first obstacle of the day – a sign that said “road closed, 7 miles ahead, local traffic only”. What do you do in that situation? Do you gamble that you can make it across the bridge or road construction anyway? Or do you try to find a detour. Fortunately, they had put this sign at a spot where I could detour in the same general direction but several miles too far east (which would then have to be returned as well). I took the detour, which ended up being another rural road that was beautifully paved with no lights, no houses, just darkness. Through here I saw a large black animal (possibly a bear) cross the road in front of me. Sometimes I feel like we live in 3rd world country. Eventually, I made it back to my intended route and on northwards. 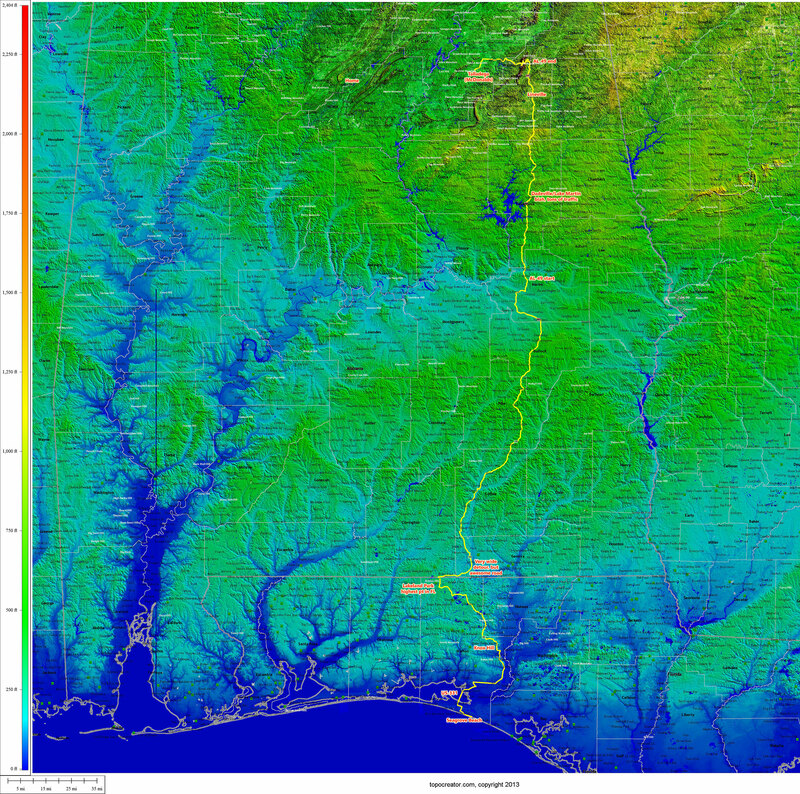 There was heavy, heavy fog through most of southern Alabama — but fortunately, there was nobody out on the roads at 5AM on a Saturday morning. I made it to Elba by 6AM with an average speed of still nearly 21mph. I stopped at the same Burger King I had stopped at on the way down to Florida. By the time I left and started heading north on AL-125, the fog had started to lift and it had started to get hot. I made it to Union Springs just as the temperature really started to spike. I ended up stopping at Subway first for a breakfast sandwich, then McDonald’s to fill up my camelbak with powerade, and Dollar General to buy some suntan lotion. Leaving Union Springs was crazy hot, and even though I was on some county roads, there was practically no shade. I stopped at a gas station at the I-85 intersection to get some iced drinks to cool off and take with me. One way to try to beat the heat. From this spot, it was a battle against the heat essentially stopping at each gas station I saw (often separated by 30 miles or more) along AL-49. I would spend 10-15 minutes cooling off and drinking cold drinks before heading north. This eventually took me far enough along in the day that the shadows started to creep across the road so that I would finally have a break from the direct sunlight. I was worried about the unpaved portion of AL-49 that I had ridden on my southward journey a week earlier, but lo and behold they had finished paving both sides during the week while we were at the beach. So I only had a short half mile section right outside of Lineville that was still unpaved. The long climb from Lineville up to Cheaha was fine until I got to Cheaha at which point I was just out of energy. I zig-zagged my way up the mountain and called Kristine to meet me in Talladega. There were lots of people camping up on top of the mountain, plus a few miles later on the descent in Camp Mac. I kept going and made it to Talladega 333 miles and 22 hours after starting. I was ready to be done! @ktoone bailed me out in Talladega, but I am happy with the ride, two state high points again! 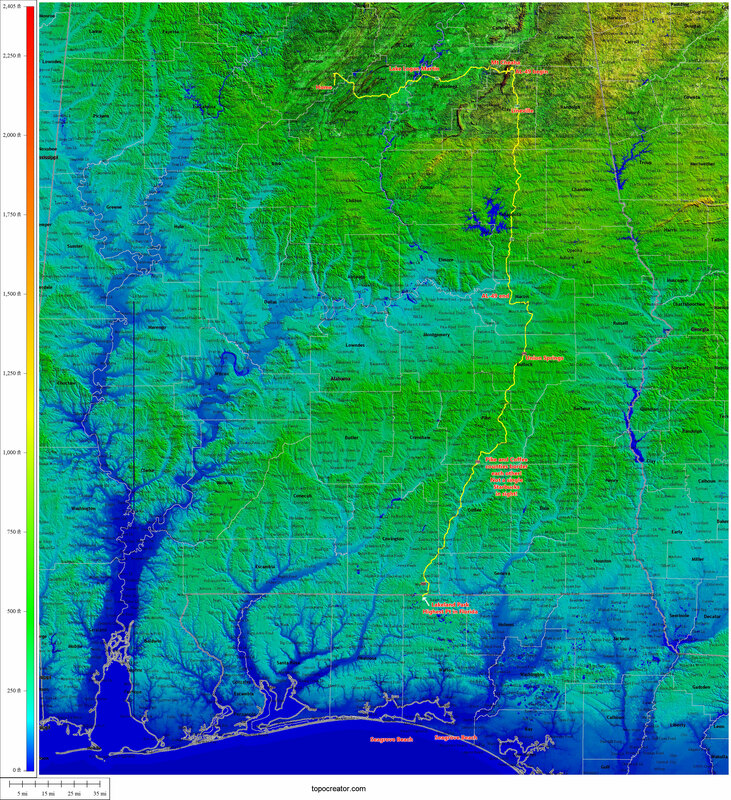 Here’s a topocreator map of my 12 county return trip … zoom to see lots of detail. This entry was posted in Adventure, Training and tagged epic, long on July 28, 2014 by kartoone. Pre-race ready to ride. Race went well and ended up 65th. Pre-race pic, happy with 65th given this was only my second road event of the year. Beautiful cool weather this year unlike last year’s scorcher, so hydration was easy. Sad that this will be the last year for Madison hosting the race, but perhaps Northern California hosting it will be a good reason to take a trip out there in 2016. Next year, however, I am aiming for a Southern California trip for the Race Across America. Already starting my training for RAAM 2015, I thought it would be good to do the race and then do a long point-to-point ride while still tired from the race. With my wife’s family in Northwestern Wisconsin, it made sense for me to ride up there from Madison for the rest of our vacation up here. I got a good start near the front, but not having ridden in a pack much this year I wasn’t good at keeping my position as other riders edged beside me. By the end of the neutral section I was already near the back of the field. I felt good on the Cat 3 climb to finish the lap and started feeling more comfortable moving around in the pack. On the third lap, I found myself near the back again when the field slowed down on the county road before the climb. I noticed on the previous lap that the shoulder is very nice, rideable gravel. So I ended up passing almost the entire field in the gravel. In retrospect, I wish I had attacked instead of pulling back into line because there was still a few more miles of slow riding. How epic would that have been to have attacked in the gravel in the national championship road race. Oh well! Instead, by the time we reached the bottom of the climb on that lap I had already slid back to mid-pack. I was running out of nutrition so I asked Kristine to feed me gels on the next lap. I was near the back the next time through the climb and pulled over to grab the gels. I grabbed them with no problem and chased back onto the back of the field, but by this point the back of the field had splintered and there wasn’t enough of us to chase back on even though we tried an entire lap plus mixing it up with the large caravan of vehicles. Many people pulled out, but Shawn Gravois (Lupus) and I soldiered on eventually catching Andy Scarano (UHC/706). Together the three of us rolled the last half lap until we caught a few more people coming off the lead group. The last person we caught was near the top of the climb, and he came back around us which was kind of the universal sign that we’re still racing. I took off up the final climb to end up finishing 65th. After the race, we wanted to check out the cave of the mounds since it was right by the course … an hour long tour was worth it even though my legs were tired and my stomach very hungry. By the end of the tour, we were practically running to the car to get to the nearest place to eat. We ended up at the Grumpy Troll in Mount Horeb. Very good, in-house produced root beer and cheese curds. Mmmmm, mmmm, mmmm. Dinner at the grumpy troll in mt horeb, wisconsin. After dinner I drove Kristine and the kids on some of the routes through the hills between Blue Mounds and Middleton where we were staying – including Observatory Rd – the views are spectacular. One more trip to Starbucks, and I started this blog while the kids were swimming in the hotel pool. I tried to time my sleep so that I would get exactly 3 hours of sleep (two 90 minute sleep cycles) before getting up. Unfortunately, they were playing a replay of the highlights of last year’s Tour de France so I think I only ended up with one sleep cycle. “Heading out for a little ride across the state of Wisconsin – 1:15am” – my instagram caption from the hotel elevator as I headed out for an approx 350 mile ride through the hills of southwestern, western, and northwestern Wisconsin. I’ve included my route map below. I tried to pick the hilliest route I could find through all the hills that was still relatively straight heading in the northwesterly direction. There were many climbs I had to skip because they went too far out of the way, but I was still surprised when I was riding at just how many hills and valleys I went through — totaling just over 20,000 feet of climbing. The upper midwest has had quite a bit of flooding problems this late spring / early summer from all the rain combined with snowmelt. This translated to many bridges being out. That makes for quite the challenge on a point-to-point ride. Only two of the bridges that were out were on my direct path. The first bridge out I came to was actually not completely out, and I was able to cross it by hanging off the side of the bridge. The second bridge was really out with no bridge left. I wouldn’t have any problems with taking my shoes and socks off and fording the water, but it was very deep mud and grass that I would need to traverse — not something I wanted to do within the first 100 miles of a 350ish mile ride. The official detour was miles and miles out of the way, so I took an unofficial detour through several miles of gravel on steep rollers, whole fields of bunnies, and endless fields of corn. Some of the other bridges out meant that the larger roads were detouring onto the route that I was already planning on taking. Fortunately, this part of Wisconsin is really rural … no cellphone coverage for over 100 miles from Blue Mounds to Sparta. 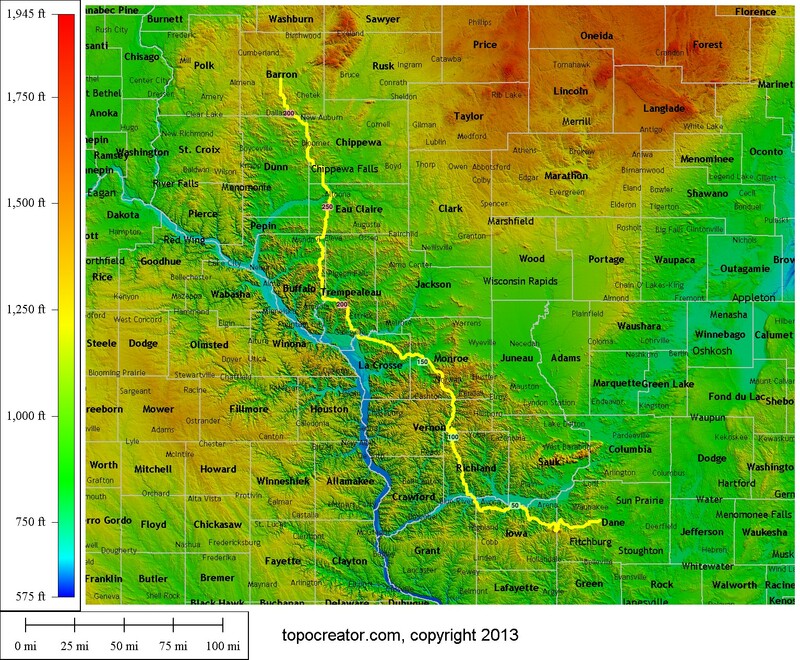 Then another 100 miles of no cellphone coverage until the outskirts of Eau Claire. So the traffic was minimal pretty much the entire day. All kinds of awesome on a point to point ride. “All kinds of awesome on a point-to-point ride” – my instagram caption at the first bridge out … before holding onto the outside of what was left of the bridge to cross the creek. They had fenced off the bridge itself well enough that I couldn’t just climb over or around the fence. 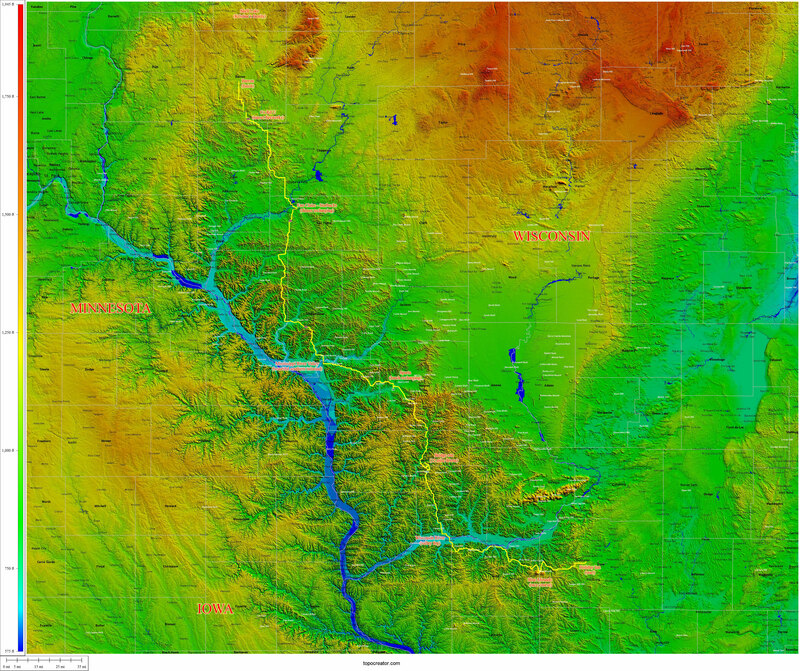 western wisconsin – ultra resolution annotated topocreator map (click to enlarge). western wisconsin – topocreator county map (click to enlarge). my route traversed 13 counties. I started out at 1:15 in the morning with the moon having already set. The Milky Way galaxy was bright enough to ride through open fields with no lights on! I tried this a couple times on the climbs up to Blue Mounds which have some stretches of open fields. Absolutely amazing. I had a four light setup for negotiating some of the fast descents in the dark – rear taillight, two handlebar mounted front lights (a 200 lumen and a small 50 lumen), plus a helmet mounted 200 lumen headlight. I thought I needed to conserve battery so on all the uphills I rode with just the 50 lumen light on. Then for the faster downhills I turned on the 200 lumen light at its lowest setting, and if the descent really started to turn downhill I flipped on the helmet light at its brightest setting. It turns out I didn’t need to worry about battery at all because this far north, it starts getting light outside by about 4:30AM. By 5AM, you can ride without a light other than a blinkie light for visibility for cars. Plus, sunset isn’t until 9PM with the afterglow lasting until about 10PM! I also had two Garmins and a cellphone to keep charged during the ride. The cellphone was the most challenging to keep charged because there was so little coverage my phone battery was constantly draining as it boosted the signal to try to find coverage — unsuccessfully. Unfortunately, we had not anticipated so much non-coverage and Kristine was tracking me online. We pretty much gave up on the tracking after Blue Mounds, and I texted her in the two towns that had coverage (Sparta and Eau Claire). I had split the route into five separate 70 mile courses, which I loaded onto my Garmin 1000. This was my first real course test for the 1000. It followed the courses with no problems, no crashes, no glitches. I know from much experience that my Garmin 800 cannot follow long courses with hundreds of turns without eventually crashing. But since I was doing all the navigation on my 1000, I was able to leave the 800 running without messing with it at all. It made it the entire 315 mile ride without crashing. I had to recharge both Garmins twice. I brought an Anker Astro Mini charger and a Gomadic Solar charger. I completely drained the Anker keeping the cellphone charged but it made it the entire day (21 hours) with a large part of the day spent searching for signals. The Gomadic I split between the 800 and 1000 and was able to keep both charged although both ended the day with low battery and my Gomadic also with its low battery signal on. Also, in Sparta I knew that I might need extra battery so I bought a wall charger which I also used to charge the cellphone during an extended Starbucks stop in Eau Claire. I’ll finish this post just with some pictures showing the scenery and describing the road as mixed conditions, a lot of smooth pavement with minimal cracking, the occasional perfectly smooth road, some larger cracks on a few of the heavier traveled roads, a few rough gravel roads, and one smooth fast dirt road which I think was being prepped for paving (county ww outside of eau claire). The terrain was steep rolling hills, long gradual climbs and descents in river valleys, plus the occasional long and steep cat 3 climb up to some of the higher ridges. Usually the top of the ridge would be flat to gently rolling with sweeping views of other ridges and valleys dotted with farms, barns, silos, forests … in other words flat out beautiful. Wisconsin river valley covered in fog. Wisconsin gravel is rough, and I got an extra few miles of gravel because this bridge was really out. Sparta claims to be the cycling capital of america. Saw lots of fireworks for the last couple hours of the ride. This entry was posted in Racing and tagged adventure, epic, nationals, race, road race on July 6, 2014 by kartoone.